When I first started dancing I had no intention of ever performing but we all know how that goes… I have now performed quite a bit both nationally and internationally on various stages. In Finland most oriental dance festivals have invited me to perform and I have also performed in Egypt, Germany, France, Sweden, Cyprus and China. Some of the most exciting performances for me have been in a Chinese village an hour away from Peking where people came walking a long way to the local school yard carrying their own chairs, a beautiful open air amphitheatre in Cyprus, Hotel Mena House in Cairo, private parties in Paris and the Finnish television. I have been a member of Masrah Association and its dance group Masrah Dance Company for over ten years now. 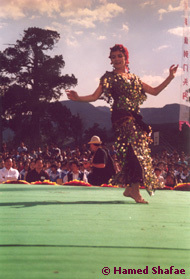 We have mounted on stage several full-length dance soirées which are stories told through the language of oriental dance. It is with Masrah Dance Company that I had the the wonderful opportunity to dance and perform together with the male dancers of Mahmoud Reda Troupe. It was all in all a great experience.